Most of the few Sinclair's pots found to-date have come from tips located around the Edinburgh and Dumphries areas in Scotland making it quite likely that this pot is of Scottish origin. 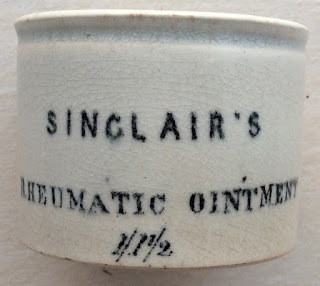 There is mention of a James Sinclair, Druggist, Dumphries in a regional newspaper in 1865 as having sold his druggist business so it could be that he was the retailer of this rheumatic ointment. An article regarding this very rare pot appears in BBR magazine no. 91, stating that one of these pots was recovered from the well known 'Bing' tip. book produced by Messrs. Houghton & Priestley, page 125.